'MAGA' is a dirty word at the White House, legally speaking. But officials haven't stopped saying it. Since the advent of the Trump Administration, the president and his senior aides have struggled to follow even the simplest ethical rules. While other scandals get more coverage, perhaps the most frequent ethical violation committed by Trump administration officials — engaging in unlawful political activity — is also the easiest to avoid. The Office of Special Counsel determined that President Trump officially became a candidate for reelection in February 2018, which requires a broader set of restrictions on federal employee's written and oral communications . 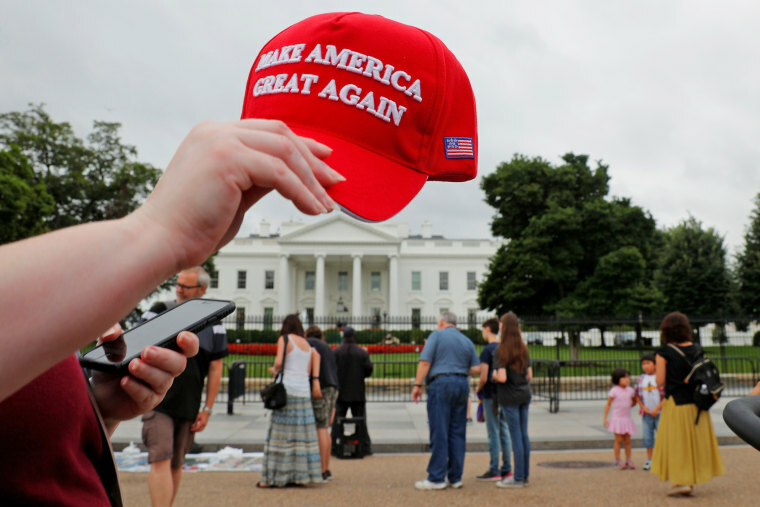 On March 5, 2018, the agency issued guidance to federal employees clarifying that, since Trump was officially a candidate,the use of campaign slogans such as “Make America Great Again” and “#MAGA” on official social media accounts and other communications was restricted. The White House also issued similar guidance. In other words, the people the president has tasked to fulfill his promise to “Make America Great Again” were supposed to stop using the slogan in official communications they make to promote their work as public officials. It seems, however, that Trump Administration officials did not get the message: Despite clear guidance, at least 10 senior officials in the Executive Office of the President, including Office of Management and Budget Director Mick Mulvaney and Press Secretary Sarah Huckabee Sanders appear to have violated the Hatch Act. Six of them did exactly what they were told was prohibited by law — used official accounts to reiterate the president’s campaign slogans. Many of these apparent violations occurred because staff within the Administration ignored explicit guidance on how to comply with the law. Besides which, the administration has failed to discipline prior Hatch Act violators, and now what started as a trickle of unethical acts in 2017 has turned into a full blown deluge of misconduct. The Hatch Act violations found by Citizens for Responsibility and Ethics in Washington were submitted to the the agency in 10 separate complaints on Thursday. The administration has failed to discipline prior Hatch Act violators, and now what started as a trickle of unethical acts in 2017 has turned into a full blown deluge of misconduct. This is, of course, not the first time; the same agency had already found that several senior administration officials engaged in unlawful political activity. In June 2017, for instance, OSC sent White House Social Media Director Dan Scavino a warning letter after finding that he violated the Hatch Act by invoking his official position to advocate for the defeat of a member of Congress in an upcoming primary. In September 2017, it found that U.N. Ambassador Nikki Haley violated the Hatch Act when she retweeted a political message from President Trump endorsing a congressional candidate via Twitter. In March 2018, the agency found that Kellyanne Conway violated the law on two occasions by “advocating for and against candidates in the December 2017 Alabama special election” during official media interviews. Although the agency recommended disciplinary action for Ms. Conway, the White House inexplicably rejected those findings. To date, none of them appear to have been officially disciplined for their misconduct. Social media continues to be the primary source of unlawful political activity for Trump’s administration, based on the apparent Hatch Act violations recently identified by our organization, Citizens for Responsibility and Ethics in Washington. The act was signed into law in August 1939 to “ensure that federal programs are administered in a nonpartisan fashion, to protect federal employees from political coercion in the workplace, and to ensure that federal employees are advanced based on merit and not based on political affiliation.”​​​​ Our democracy depends on the assurance that elected officials do not use the tools of the government to keep and maintain power, and the law ensures that government resources are not used in support or opposition to any political candidate or party. Violations of the Hatch Act can result in a range of discipline including removal, debarment, suspension, reprimand and civil penalties. But the lack of consequences for the administration’s previous Hatch Act violators may have led, however indirectly, to the avalanche of additional violations. The problem is clearly systemic, and the behavior has only increased in frequency since officials got off with a slap on the wrist for prior offenses. It seems clear that many senior administration officials do not respect the agency's guidance and do not fear consequences for their actions. But these latest incidents fly directly in the face of the clear guidance regarding the use of social media now that Donald Trump is a candidate for reelection and should not be viewed in isolation. With federal elections approaching, this is an opportune time for the agency to consider additional measures to prevent the rampant abuses coming from this administration. Both the Office of Special Counsel and the White House must work harder to prevent Trump administration officials from undermining our democracy by violating the Hatch Act. Virginia Canter is the Chief Ethics Counsel of Citizens for Responsibility and Ethics in Washington. Her prior experience includes serving as Ethics Advisor to the International Monetary Fund, White House Associate Counsel to Presidents Obama and Clinton and Senior Ethics Counsel for the Department of the Treasury. Donald K. Sherman serves as CREW’s Deputy Director. Donald previously served as Senior Counsel on the Senate Homeland Security and Governmental Affairs Committee as well as Chief of Staff and Senior Counsel for Oversight and Investigations in the Office of General Counsel at the U.S. Department of Housing and Urban Development . Virginia Canter is the Chief Ethics Counsel of Citizens for Responsibility and Ethics and Donald K. Sherman serves as CREW’s Deputy Director.